Curling is a sport played on ice. Players slide curling stones on the ice towards a target, called the house. There are two teams with four players on each team. Each team slides eight stones, this is called an end. After an end the team with the stone closest to the centre of the house (target) scores points. The game is over after eight or ten ends. The team with the most points is the winner. The player sliding the stone can make it turn or curl slowly. Two other players on the team sweep the ice in front of the stone with brooms. This is to make the stone stop in the right place. Curling is played at the Winter Olympics. Curling was invented in Scotland in medieval times. It was played outside in the winter because there was lots of ice. Today curling is played all over Europe and in many other countries such as Canada, the United States, Japan and South Korea. Curling was played at the Winter Olympics for the first time in 1998. 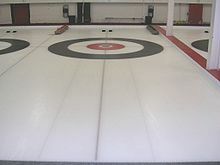 A curling sheet showing the house. The ice is called a curling sheet. It is a rectangular sheet of flat ice, between 146 and 150 feet (45-46 metres) long and 14.5 to 15.5 feet (4.4-5.0 metres) wide. The house, or target, is marked at the end of the sheet by coloured rings. The rings help players to aim for the centre of the house. They are also useful to decide which stone is closest to the centre when scoring. There is also a hack at the end of the sheet which players push against when sliding a stone. Curling stones are made of granite. They are heavy, weighing 38-40 pounds (17-20kg). There is a handle on the top of each stone to help slide and turn the stone. The handles are different colours for each team. The stones are usually red for one team and yellow for the other team. Curling brooms or brushes are used to sweep the ice in front of the stone when it is sliding. Players wear special shoes for curling. One shoe has a smooth surface for sliding on the ice and the other rough. The purpose of the game is to score points by getting stones close to the centre of the house. Players from each team take turns to slide a stone towards the house. This is called delivering or throwing a stone. An end is completed when all stones have been delivered. There are eight stones for each team. The winner is the team with the most points after all ends have been played. There are usually eight or ten ends. The captain of the team is called the skip. The skip chooses how hard the stone should be delivered, the direction of delivery, and the amount of turn (curl) that the stone should be given. The skip can choose to aim the stone for the house, hit one of the other team's stones out of play, or make a stone stop before the house as a guard if their team has a stone in a good position. The player delivering the stone starts at the hack. The skip stands at the other end of the curling sheet behind the house. The skip shows where to aim the stone. 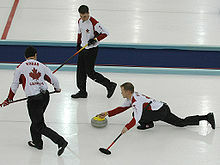 The other two players sweep the ice in front of the stone as it slides. The players take turns to deliver stones. When the skip is delivering a stone another player stands behind the house instead. To deliver a stone the player puts one foot on the hack. The player lines up towards the skip. The stone is on the ice in front of the foot in the hack. The player then slides the stone back before sliding forwards on their other foot. The player lets go of the stone, gently turning the handle just before letting go to give the stone curl. Then the other players can sweep the stone. Sweeping helps the stone to travel faster, and makes it curl less. The aim of sweeping is to help the stone stop in the right place. Measuring to find the stone closest to the centre of the house. Points are scored at when an end has finished. The team with the stone closest to the centre of the house wins the end. The team scores one point for every stone that is closer to the centre than the other team's closest stone. Only stones that are in the house count for scoring. If it is difficult to see which stone is closest to the centre of the house there are special measuring devices to help. Sometimes neither team scores any points, this is called a blank end. ↑ Wetzel, Dan. (February 19, 2010) Don’t take curling for granite Yahoo! Sports. ↑ Federation, World Curling. "World Curling Federation - Page not found". World Curling Federation. ↑ Federation, World Curling. "World Curling Federation - Rules and Regulations". World Curling Federation.